Food Cart Friday | Food E.
I have to blame my hatred for lunch on my lack of midday meal options during the week. Anyone who works in midtown Manhattan knows that after your hundredth Cosi salad, Europa “pressata” sandwich, or Cafe Metro wrap, you grow to dread your lunch hour and look to McDonald’s as a source of nourishment. It’s that dire. It is in that vein that I am constantly on the lookout for new and exciting midday menu options. Introducing Mia Dona‘s meatball cart. 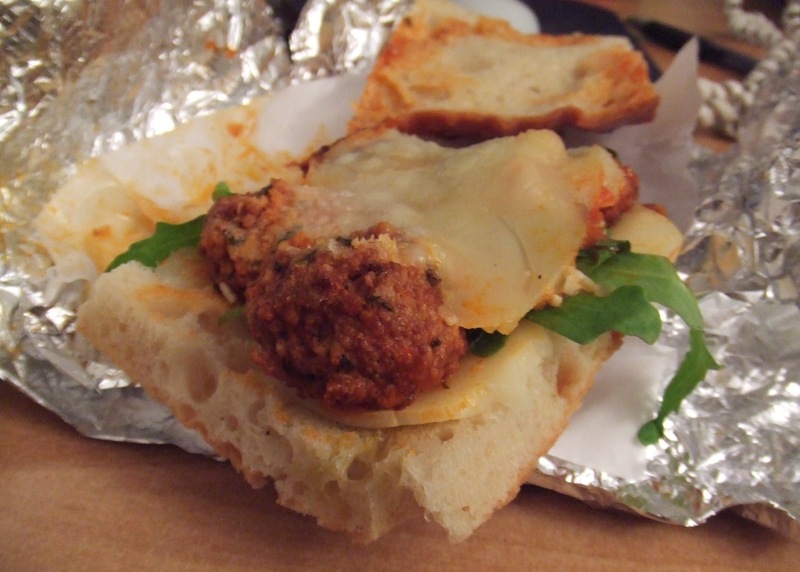 For $7 from 12-2PM Monday thru Friday midtown lunchers can enjoy 4 tasty meatballs on fresh baked rosemary focaccia with melted caciocavallo cheese and spicy arugula ($6 gets you the meatballs a la carte). Verdict: HELLO MY LUNCH HOUR SAVIOR! My dining companion, Meagan, put it best: “At 12:51 I opened the sandwich. By 12:54, it was gone. That sandwich didn’t stand a chance.” The meatballs were done just the way I like them: mostly ground beef with just enough spice to hold them together and give them a robust Italian flavor. The bread was soft and salty, the cheese the perfect smooth complement to the Italian spices, and the arugula the touch of spicy freshness needed to break through all the heartiness. The Meatball Wagon (too few phrases inspire the salivary glands like ‘Meatball Wagon’ eh?) has only been open for just over a week but the woman working the cart told me they’ve been selling out every day. We commiserated over the lack of lunchtime options for a midtown worker and I sheepishly told her I’d traveled sixteen blocks and three avenues for this tasty treat. “I’m too lazy to make my own lunch sometimes,” I told her, woman to woman. Midtown worker to midtown worker. Thanks for pointing out the great lengths I’ll go to for a meatball sandwich, Cart Lady. Thanks a lot.